Princess Vyssa is the daughter of King Coltzan III, and is as loved by all the inhabitants of Sakhmet as she is beautiful. She is next in line to her father's throne, and cannot wait to take over his rule. Since she is so young and very inexperienced, she has to look to the advice and guidance of the Royal Council. I'm so tired of those senators," the princess says in between brushing her shiny dark hair, "telling me what to do and how to act, I mean, I AM the Princess. I AM the daughter of the king. If I wanted to I could have that fat oaf Palpus put on a strict diet, or secretly change the prescription in his monocle so he'll have blurred vision. Oh, and that Senator Barca with her disaproving tones and boring lectures. She annoys the sand straight out of my sandals, and don't even get me started on that Princess Sankara. If she thinks I'm going to listen to another tale of how great things were in HER court, I will scream!" DO NOT REMOVE THE CREDIT. Each year, the Faerie Festival is held in a new place, depending on what type of faerie the hostess is. A few years back, Psellia hosted the festival upon a cloud in the sky. Two festivals ago, Illusen welcomed everyone to her glade for delicious sweets, and last year Nereid hosted this gala event in the slowly rebuilding Maraqua, which was still a secret to most Neopians at the time. This year, the most unlikely hostess of all will be Jhudora the dark faerie. There has been playful muttering among the light faeries that they will be sure not to sample any food until she herself has eaten some first. Fyora has made it clear, however, that even though dark faeries (especially Jhudora) aren't generally considered the trustworthiest sort, they are faeries nonetheless, and their turn to host a festival has arrived. Many of the earth faeries have asked Illusen whether or not she'll be attending. "Well, Jhudora did come when the festival was hosted at my glade few years ago, although I have a sneaking suspicion that she was responsible for the 'soup incident.' I can't really pass up the opportunity to return the favour, or harass her by being nice to her, now can I?" was the earth faerie's only response, followed by a mischievous grin. I'm so tired of those senators," the princess says in between brushing her shiny dark hair, "telling me what to do and how to act, I mean, I AM the Princess. I AM the daughter of the king. If I wanted to I could have that fat oaf Palpus put on a strict diet, or secretly change the prescription in his monocle so he'll have blurred vision. Oh, and that Senator Barca with her disaproving tones and boring lectures. She annoys the sand straight out of my sandals, and don't even get me started on that Princess Sankara. If she thinks I'm going to listen to another tale of how great things were in HER court, I will scream!" Being stuck in that stuffy palace is no place for a young princess to be," Vyssa says, "especially if I'm going to be ruling this great land. I need to be out rubbing shoulders and wings with the citizens of my land. I need to know how the city works, something my father never exposed me to. He was too busy telling the tale of how he defeated that savage Monocerous with his bare paws. You don't know how many times I heard that story. My father sheltered me behind these palace walls for far too long. He was a strong warrior and kept me safe from the outside world, but now is the time to act, and act I will. Sakhmetians only know me for my beauty, but that is going to change. It is my time now." Being stuck in that stuffy palace is no place for a young princess to be," Vyssa says, "especially if I'm going to be ruling this great land. I need to be out rubbing shoulders and wings with the citizens of my land. I need to know how the city works, something my father never exposed me to. He was too busy telling the tale of how he defeated that savage Monocerous with his bare paws. You don't know how many times I heard that story." Princess Vyssa is the daughter of King Coltzan III, and is as loved by all the inhabitants of Sakhmet as she is beautiful. She is next in line to her father's throne, and cannot wait to take over his rule. Since she is so young and very inexperienced, she has to look to the advice and guidance of the Royal Council. Abigail, Aristotle's little sister, is bright and insightful for her age, but she certainly doesn't have her big brother's ego. While she loves playing with her Usukis and participating in other activities, Abigail has also picked up some gaming skills from her brother and enjoys a good game from time to time. Her skills, however, are typically a far cry from those of her brother, who spends all of his time playing and practising. As a result, Abigail's challenges are generally easier than those that Aristotle offers. Never one to be subtle, Aristotle A. Avinroo, the self-proclaimed "master of the Games Room" is known for his egotistical nature and insatiable drive to constantly prove himself as the best gamer in all Neopia. 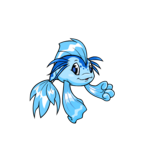 Despite claims that no one can possibly best him, he's built quite an anti-following of Neopets who'd like nothing more than to see this Blumaroo eat his words. Whoa, a pea, that's something you don't want to see when all you've got in your arsenal is a wand of something or other. I mean, how does one withstand the might of a single pea? The attack pea is a tiny ball of power, the perfect item for any well-rounded arsenal. The attack pea is a tiny ball of power, the perfect item for any well-rounded arsenal. Throw this little green wonder out there and watch your opponent buckle beneath its awesome might. This lightweight, compact weapon can fit into almost any pocket, hand, hoof, or paw. Maybe your pets can even eat the pea if they come down with a case of the munchies during battle. It could happen, but at the cost of 1.2 million NP, it probably shouldn't. Beware the staggering prowess of the pea! Vicious things come in small green packages. You may be tempted to giggle at the thought of being attacked by a pea. Resist that temptation, for this one pea has the strength of many peas all attacking at once, and that hurts. A lot. Are you already dreaming about it? Already counting your precious horde of Neopoints to see if you have enough? Can you almost imagine your pets holding that little round marvel and tossing it, slow motion, at their opponent? Well, stop dreaming. Go out and get it! Beware the staggering prowess of the pea! Vicious things come in small green packages. I'm so tired of those senators," the princess says in between brushing her shiny dark hair. Telling me what to do and how to act, I mean, I AM the Princess. I AM the daughter of the king. If I wanted to I could have that fat oaf Palpus put on a strict diet, or secretly change the prescription in his monocle so he'll have blurred vision." Princess Vyssa is the daughter of King Coltzan III, and is as loved by all the inhabitants of Sakhmet as she is beautiful. She is next in line to her father's throne, and cannot wait to take over his rule. Oh, and that Senator Barca with her disaproving tones and boring lectures. I'm so tired of those senators," the princess says in between brushing her shiny dark hair, "telling me what to do and how to act, I mean, I AM the Princess. I AM the daughter of the king. I'm so tired of those senators," the princess says in between brushing her shiny dark hair, "telling me what to do and how to act, I mean, I AM the Princess. I AM the daughter of the king. If I wanted to I could have that fat oaf Palpus put on a strict diet, or secretly change the prescription in his monocle so he'll have blurred vision..."